Where to begin? My goodness, I love these babies! 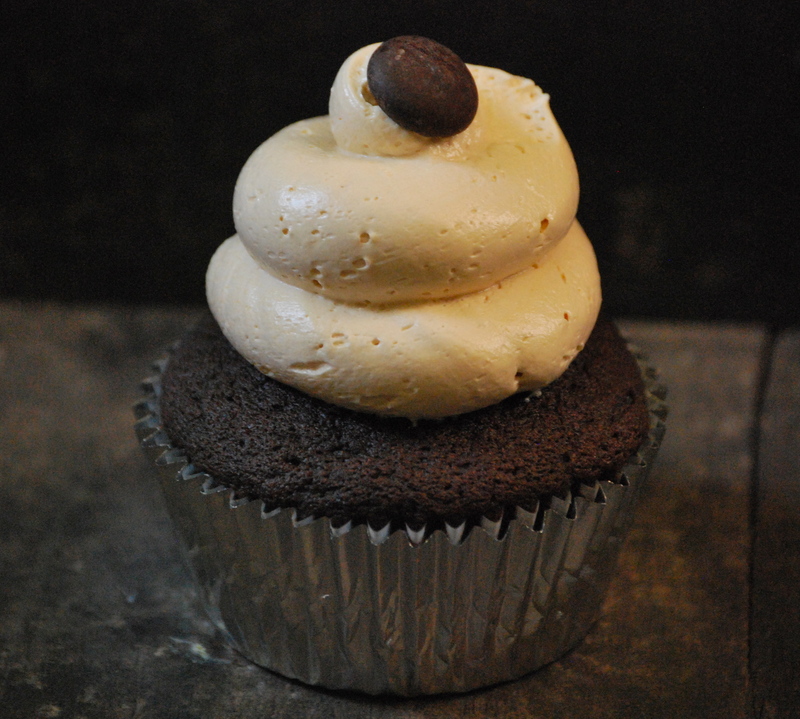 I had been craving a proper chocolate cupcake with a salted caramel frosting for a long time. I knew where I could probably buy one, but sometimes I get a little ticked at the steep price tag for just a “bite” of cake– especially when my kids beg for (and usually get) them every week. I got to thinking, and decided to try to make them myself. 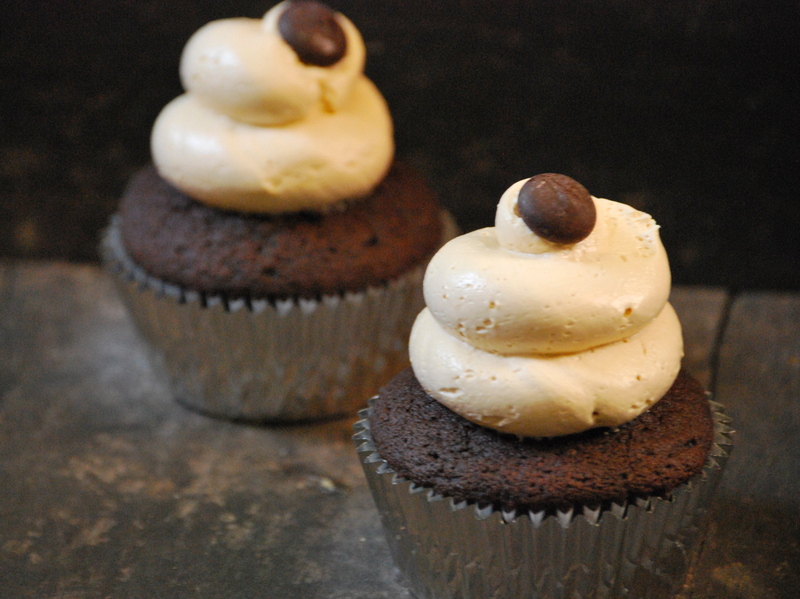 I combined several recipes, and came up with cupcakes that are even better than I imagined. I used my favorite chocolate cupcake recipe, but made it with coconut oil. The cake is moist and dense. I’ve become addicted to coconut oil lately (I’ve even made a coconut oil body butter–but more on that another time). 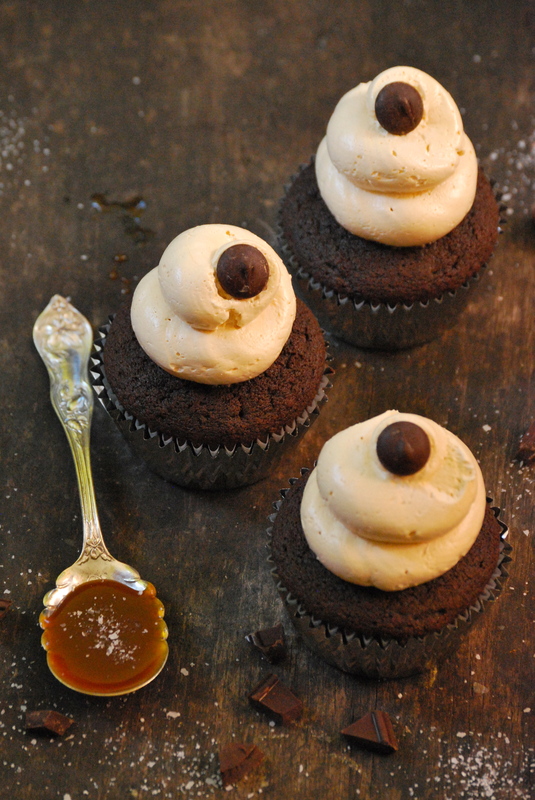 These cupcakes have a nice, subtle coconut flavor that blends perfectly with the chocolate and caramel. Now my goal was to use a healthier fat– which worked– though I’m not sure the ‘healthiness’ mattered, since I piled a mound of buttercream on top. Oh well, they are cupcakes, after all. Now, let’s talk about the salted caramel. 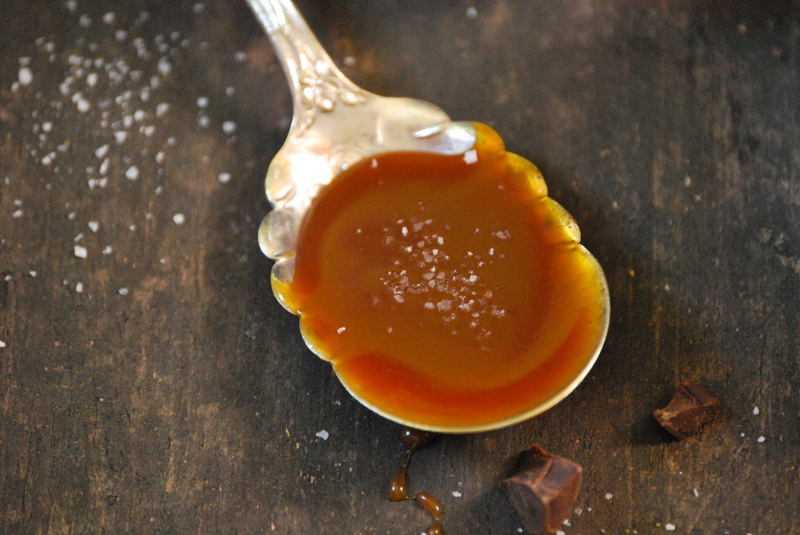 Salt and caramel are such a heavenly combination. So perfect. You will not use all of the caramel, which is a good thing. Just keep it in your refrigerator, and use later poured over ice cream. Or drizzle it over a brownie. Or just enjoy it by the spoonful (or maybe that’s just me). And you know that deliciously thick and rich frosting that makes those specialty shop cupcakes so good? Yeah, that’s this stuff. It not just a buttercream, it’s meringue buttercream. Big difference. This one uses egg whites, but don’t worry, they’re perfectly safe because they’ve been carefully cooked. They whip up beautifully and become a silky treasure when mixed with the butter. 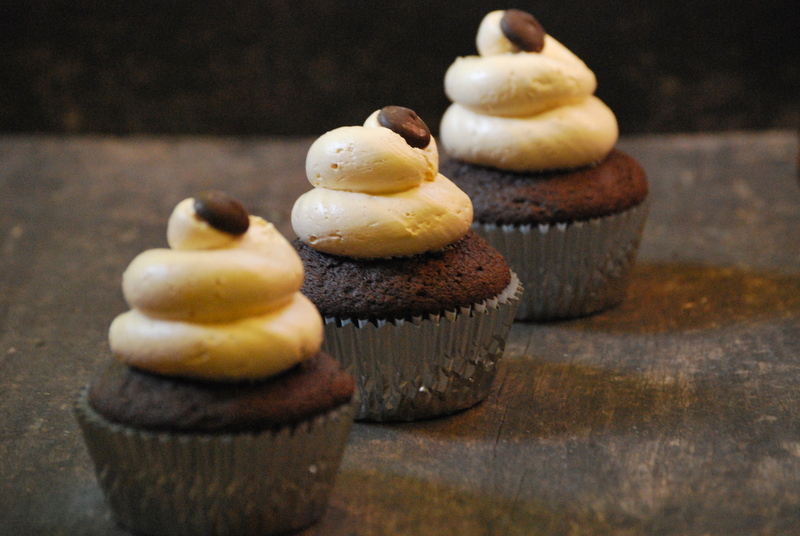 Add that liquid gold salted caramel, and you’ve just made one of the most delicious frostings possible. To make the caramel: In a medium saucepan, combine the sugar and corn syrup along with 1/4 cup water. Gently stir them together, being careful not to splash the sides of the pan. Cook over high heat until an instant-read thermometer reads 350°F, or until the mixture is a dark amber in color, about 6-8 minutes. Keep a watchful eye on it, as it can turn from a golden amber color to burnt very quickly. Remove from heat and slowly add the cream (be careful, it will bubble), and then add the fleur de sel. Whisk in the sour cream. Set aside to cool to room temperature. Or refrigerate if making ahead of time, then bring to room temperature before mixing into the buttercream. For the Cupcakes: Preheat oven to 350°F. Line 16-18 standard (1/3 cup) muffin cups with paper liners. Combine cocoa powder and chocolate in medium bowl. Pour 1/2 cup hot coffee over; whisk until smooth. Whisk in sour cream. Whisk flour, baking soda, and salt in another medium bowl to blend. Using a stand mixer, beat brown sugar, coconut oil, granulated sugar, eggs, and vanilla in large bowl until light and creamy, about 2 minutes. Beat in flour mixture, alternating with chocolate mixture in 2 additions. Careful not to over-mix. Divide batter among paper liners. Bake until tester inserted into center comes out with some crumbs attached, about 16-18 minutes. Cool in pans for about 10 minutes. Transfer cupcakes to cooling racks and cool completely. To make the meringue buttercream: Put the egg whites, sugar and salt into a medium-sized heatproof mixing bowl over a pan of simmering water, and whisk gently and continuously until the egg whites reach 140°F. The eggs whites will be hot and the sugar will be dissolved, about 3-4 minutes. Remove from the heat and pour into a bowl of a very clean stand mixer. Using the whip attachment, whip mixture on high until thick and cooled, about 5 minutes. (Make sure the meringue is cooled to room temperature before adding the butter, or the butter will melt and will not make a proper frosting). With the mixer running, slowly add the butter to the meringue, one chunk at a time. Beat until the buttercream is smooth and spreadable, scraping down the sides of the bowl, as needed. With the machine still running, slowly add the salted caramel and beat until well blended, about 2 minutes. Troubleshooting: If for some reason your buttercream is too soft (perhaps your meringue wasn’t cooled enough), stir the buttercream over ice water; then beat with a machine until smooth and spreadable. Sometimes buttercream separates – it will look like scrambled eggs. If this happens, briefly immerse the bottom of the mixing bowl into some hot tap water, then beat again until the buttercream is smooth and spreadable. After the caramel and cupcakes have cooled to room temperature, using a small knife carefully cut out a 1/2-inch circle midway down in the center of the cupcakes. Fill the hole with the salted caramel just to the surface. Place the salted caramel meringue buttercream into a large pastry bag and top each cupcake with a swirl of it — be generous! Frosted cupcakes should be eaten as soon as possible, but will hold their shape for a couple hours. Unfrosted cupcakes can be stored in an airtight container for a few days. Leftover caramel should be treated as gold, because it is that delicious. Store in jar and refrigerate — it makes a wonderful topping for ice cream. Enjoy! Sources: Chocolate Cupcakes adapted from this recipe. Salted Caramel adapted from Baked Explorations. Meringue Buttercream adapted from How to Bake. 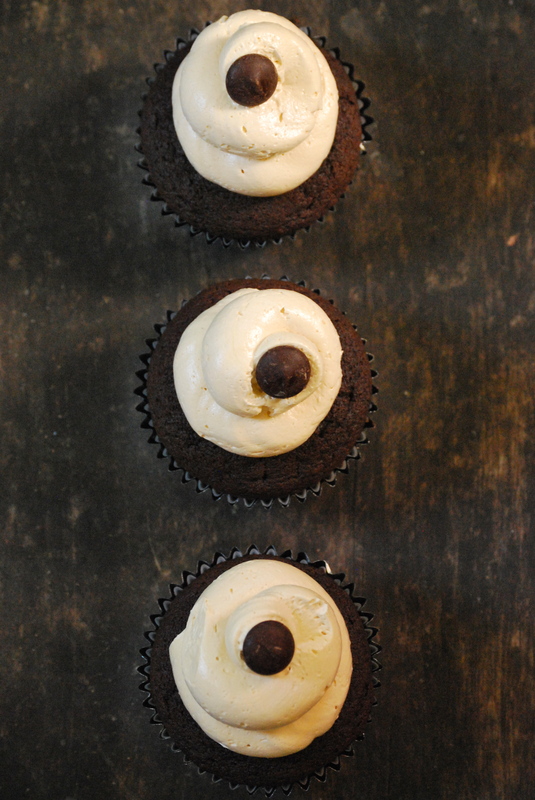 Thanks for stopping by Relishing It today — hope you enjoy these cupcakes! Are you bringing me one on Saturday? Because if not, we’re no longer friends. I’d better get baking then! I die for anything salted caramel! Yummy! These look just delightful! Im a sucker for chocolate and caramel, and throw on some salt, swoon! I couldn’t agree more, Julia! It’s the salt. Definitely making these this weekend! Beautiful photos, too! Laurie… I have found my cupcake recipe and was planning to use this as my frosting recipe for some cupcakes for a friend’s graduation. After reading through, this may not be the frosting I need since it suggests eating it right away. Your thoughts? Is there a different frosting I should try instead? I am excited to make these cupcakes but want to make them super yummy. Well, that was me Laurie… this is Robin and my golf tournament wordpress admin board is still on. Woops! I think this frosting will work very well, Robin. Our frosted cupcakes actually kept well for a couple of days. AND the leftover frosting in the refrigerator kept well, too. You could frost them right away or wait until you need them. If you refrigerate the frosting, just make sure to stir it to “fluff” it up. Either way, this frosting rocks and I think it will be very lovely. Good luck! I love this recipe. Definitely worth the time to make homemade everything- I’m the baker of my friends and family and I have a feeling this is going to be requested regularly. Only oops- I got so excited to frost them that I forgot to cut out and put the caramel in- simple fix: drizzle a little on top of the frosting. Thanks! !